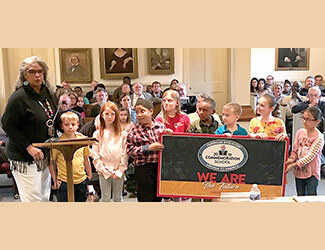 Lancaster Primary School teacher Faith Waddy and a group of talented and gifted students attended the March 28 Lancaster supervisors meeting to give a presentation about their participation in a statewide study project to learn about the important events that happened in 1619. The board adopted a resolution to recognize the school as a 2019 Commemoration School through American Evolution 1619-2019. Schools, the recurring theme of every Lancaster County meeting this season, were again at the center of discussion at a board of supervisors meeting March 28. As the meeting began, board chairman Jason Bellows asked for a moment of silence to honor the recent passing of two friends of the county. Robert Harper, superintendent with Virginia Department of Transportation Brookvale office, and Frank Pleva, former county administrator, were both advocates for the community. Also, a thank you on the occasion of National Vietnam War Day to veterans who were present was offered by citizen Charlie Costello of Merry Point. During the public input session, four county residents shared their opinions about how the supervisors should consider the fate of their schools.